Continuing our chapter’s observance of the year of Julia Morgan, we undertook an ambitious long-weekend program down California’s central coast. Two of Ms. Morgan’s most famous works, works that illustrate the wide-range of her talent, were our goal. We gathered at the Asilomar Conference Grounds in Pacific Grove on the morning of November 7, where we heard informative lectures on the history of what was originally a conference center Morgan designed for the YWCA, on Morgan’s site planning and on subsequent additions expanding on Morgan’s original plan. After lunch, armed with this information, we had a tour of the camp by Asilomar historian Michael Meloy. A trip farther down the coast brought us to one of the icons of California architecture, Hearst Castle, where Morgan’s grand gestures are a long way from the cozy, woodsy feel of Asilomar. We were fortunate to have as host architectural historian Victoria Kastner, who drew on her 36 years of work at the castle to lead a rich four-hour tour. The Hearst Corporation provided lunch and tour at San Simeon Village, at the Pacific’s edge. Morgan designed most of the village’s buildings for staff employed at the Hearst ranch. On Monday morning, many of us visited the Benjamin Patterson Ranch north of Paso Robles. Five generations of Pattersons have farmed this land, and the structures, tools and machinery reflect that time. We learned of the technique of rammed earth construction used in building the main house (1896) and smoke house. Dawn and Lester Patterson provided a hot lunch. Returning to our Morgan theme brought us to Fort Hunter Liggett army base. 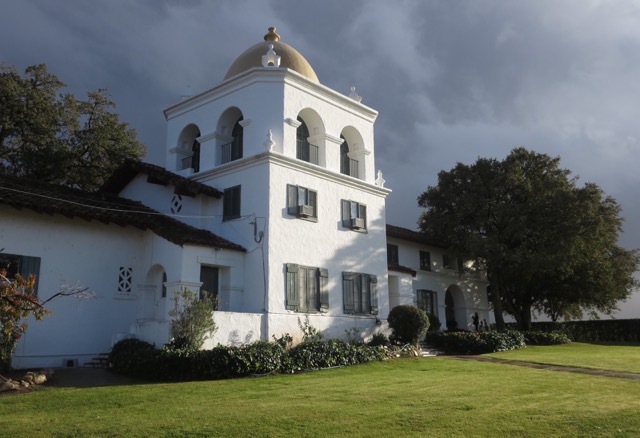 This land was part of the Hearst Ranch, and Ms. Morgan designed a Mission Revival hacienda (1930) to accommodate the ranch manager and ranch hands. Hearst sold it to the army in 1940. Today, a private concessionaire operates the hacienda as a hotel. Phil Bellman organized Monday’s events.